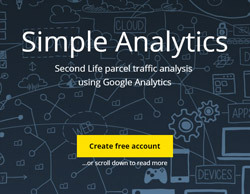 SimpAnalytics – the tool to measure SL traffic! Simple Analytics is latest project from a creators of SmartBots! Whether you are a large SL business owner managing multiple sims, or a small one, you can now collect, analyze and review the traffic of all your SL parcels. Both historical and real-time data available. SimpAnalytics allows you to use Google Analytics, which is designed to track hits on websites. Within minutes you can start tracking your land traffic. Traffic analysis and data management is an essential aspect to every business in Second Life: you can get started at SimpAnalytics website. It’s absolutely free! Visit Simple Analytics website and create a free account now! Theres’ a live help chat available if you get any questions.